Anja Gockel - for diversity in Europe. Although Anja Gockel took her inspiration from Patti Smith, Punk- Rock- Legend of the ’70s it's her so admired liberalism that went into the essence of the collection. 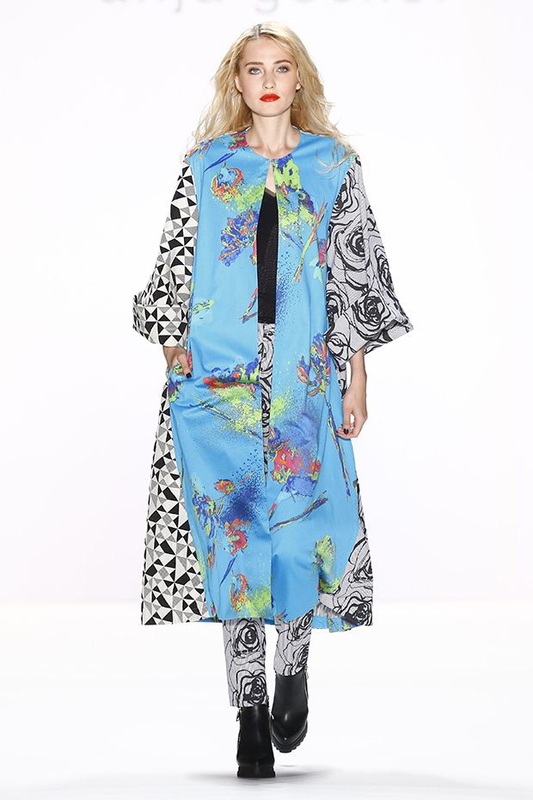 Today, more so than ever before we are seeing a stronger and louder call for acceptance of diversity, and Anja Gockel embraced a colourful and eclectic expression of diversity in her Spring Summer 2017 collection at Mercedes-Benz Fashion Week in Berlin. In keeping with Gockel’s reputation for bright colours and experimental prints, the collection celebrates diversity using a multi-coloured array of innovative materials and patterns, often combined in vivacious and unconventional looks. Strong reds, blues, greens and yellows are put together with blacks and whites; while vivid magenta and turquoise are combined with rich yellow, royal blue and red to create a unique, diverse picture. A tight, bright orange neoprene skirt was paired with a sunny yellow blouse and a black slouch hat; and other stand-out looks included overalls, floral print dresses,straight-cut trousers paired with loose-fitting shirts and geometric mixed print kimonos. Bright orange and yellow combination. The inventive and imaginative use of print was further emphasised by the use of different country flags made into wearable pieces to show the fusion of individuality and integrity.Materials ranged from haptic cotton and flowing silk to casual jersey and fine jacquard. And the look of the show? A male model strutting down the catwalk wearing high heels that even I’d have trouble in, draped in a stunning gown made of rainbow coloured silk. With this look alone Anja Gockel proved that you can make a political statement using the art of fashion in a peaceful way!